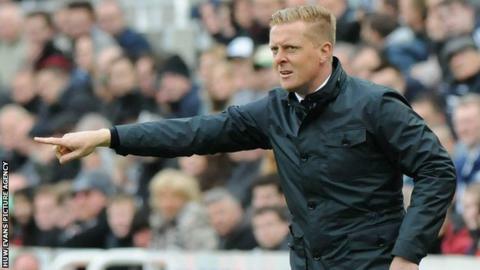 Former Swansea City manager Kenny Jackett believes the club are back on track under current boss Garry Monk. Wolves head coach Jackett signed Monk as a player for Swansea from Barnsley in 2004. Monk replaced Michael Laudrup in February 2014 and after securing Premier League safety last season are currently eighth in the table. "Garry's sorted them out a little bit now and got them back on track I feel," Jackett said. "He's got their attitude right and he probably knew from within that dressing room exactly what was needed to get the club to their best again. "He's done that and I'm sure will go and build and build strong." Monk took the reins temporarily under the title of head coach after former Denmark forward Laudrup was sacked in February 2014. The former club captain secured Premier League safety with two games to spare and was appointed manager on a permanent basis in May 2014. Swansea have achieved their highest ever number of points in the Premier League in Monk's first full season as a manager. Former Wales and Watford defender Jackett spent just under three years in charge of Swansea and during his time in charge secured promotion to League One in 2005. Monk was a member of that promotion winning side and Jackett has been pleased with how his former player's career has progressed. "He's done very, very well in a number of roles," Jackett told BBC Wales Sport. "He was a terrific player, club captain and now, just over a year in management, he's taken to it like a natural. "He's had a fantastic first year." Jackett, who guided Wolves to promotion to the Championship as League One champions last season, has also praised Swansea chairman Huw Jenkins. "I think his biggest strength is knowing what the club needs," Jackett added. "He's [Jenkins] guided the club in all of their big decisions. Recruitment is a key area in every single football club and Swansea's recruitment has been fantastic. "It's something every club should look at."